Prophecies are signposts and roadmaps on the journey of destiny. They provide comfort and give assurance from the mind of God concerning the future. They stabilize us in the midst of the storms of life. When others are concerned and fear grips their hearts, a person with prophetic insight is not moved because he has understanding of the times. However, you don't just receive prophecies and go to bed. You have to war with them to bring them to pass or avert them when it's negative. God reveals to redeem. You have to hold God at His word and call them to manifestation. 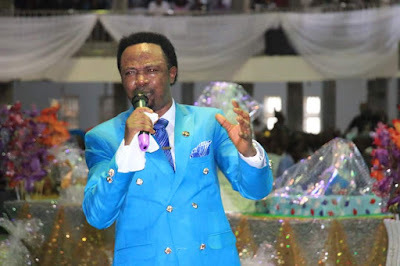 Thus, this 72 prophetic insight for 2017 by the Set Man of Champions Royal Assembly, Bro Joshua Iginla for individuals and nations is meant to guide them into what's at stake and take appropriate precautions where necessary. 1 In 2017, I see more pressure on his Excellency, Mr. President to sack the incumbent CBN Governor. It will take divine Grace for him to remain in that office. 2. Senator Saraki. The Senate president should not think that the trials are over. I see more storm and trials that will take a new turn from his enemies and political distractor. They will scheme for his removal. He should be very careful because, I see much betrayal of promise. They might backstab him. I see promises made in the secret to him that will not be kept. He should pray that the people in his camp should not see the storm overwhelming him, thus leaving him in the storm. 3 The hardship and poverty in Nigeria will increase. Mr. President will do all he can in his power to reshuffle some of his cabinet in order to rescue issues but because his administration has more enemies than friends, they will frustrate all his efforts. However, I see a light at the end of the tunnel but it will not free us from this hardship. Rather, it will increase, it will be strong but I have good news for you, those who know their God will be exempted. 4 I see a part in this country that the military will move swiftly to rescue because of the crisis that will come out of there. it will be like a tail of crocodile slapping the water. It is between 2018 - 2019 that this crisis will blow but in 2017, we will see a symptom of it splashing the water. Sensitive crisis from one part of the nation that needs the current administration to be sensitive and pray about it. 8 - His Excellency, Mr President should pray for his health, I see him traveling out for an unscheduled health checkup. But this time, it will be more serious. He should pray for his health, God will keep him. 11 The current government will prevail so much over the issue of Boko Haram but it will not die. Rather, it will take a new dimension. It will worsen but at the tail end between 2017 - 2018, most especially 2018, that's when we will get the victory better on the issue of Boko haram. 13 I see another monster that will be created before the end of this regime meant to distract the incumbent President and his crew. Just as Boko haram was a distraction to the previous Government. I see another distraction that is coming. It will be stronger than what we heard about. That's why we should continue to pray not to continue going from one circle of battle to the other. 13 The agitation of Biafra will take another turn. Pray so that this time it should not be bloody. We should pray for Kanu Nnamdi, the biafra leader, because I see an health challenge and I see bitterness and agitation from this same region he is coming from. And I pray the current admistration is very sensitive over the case of Nnamdi Kanu because what I see is not too good. May the Lord keep Nigeria. Will he come out? Yes! How will he come out? I can't really tell. I see it as something divine. I don't see legal issue as a means of removing him from there. 14 I keep repeating this prophecy for the past three years and I'm still repeating it. There is a great man of God whose candle light has finished. There's nothing we can do about it. This is an home calling to glory and I keep saying this. God said I should re-echo it. This is an important but sensitive minister in the body of Christ. His candle light has gone down but is living by Extra grace. I still see this same prophecy in 2017. I pray God will show mercy and grace on him. 17 The clamour for his Excellency, Mr president, to come back in 2019 will be very high. Buhari should be very careful. There's a lot of judases around him. They are only digging his grave for him unknowingly. He should be very careful. 21 Rivers and Ekiti state Governors should be very careful. There will be attempt even over their lives. I don't know by which party but that's what I saw. 23 APC has served its purpose. In 2017, the party will begin to see major Cracks and before 2019 there's a powerful party that will merge out and will form strong alliance in 2017. It will become solid in 2018. APC has served it's purpose. It's like a piece of paper thrown away after being used. APC has served its purpose. A new party that will take Nigeria to the next level will rise up and I don't know how but I see this party consisting of members of the ruling party and opposition party fusing together causing what I call unwanted diffusion that will lead to a future catastrophe but before it, there is going to be calm on the nerves of Nigerians. Even the new party that will come in is like joining petrol and Kerosine together and mixing it up with water. 24 I'm sorry to say this but it is what I Saw. Nigeria will continue to have old faces ruling this country. They will keep circulating powers among themselves. The faces we will be seeing won't be really new. They will keep changing from one regime to another till 2031. 26. God said there are some cabals he's going to call to glory before the true David emerge. 28. In 2035, there will be a strong female politician that will rise. She will become very strong, fearless, confrontational and she will be a running mate. That's a vice president position. 29. Between 2039 - 2051, Nigeria will have a female President that will turn the country in another dimension. 30. The tension in 2019 will be worse than 2015 election. We must pray against military intervention, please let's pray as it can be averted. 33. Some politicians are agitating to rule forever. As long as they are on the seat, there's nothing anyone can do about it. Hear what God said about them. He said ' Is it not the living that will rule? The dead body can't rule. 37. Buhari will do his best to move Nigeria forward but all his best will be thwarted by the enemies of Nigeria. It is not about Buhari, it is about some cabals who are enemies of Nigeria. Though we have angels sitting at the helms of affairs, if this cabal don't die, Nigeria will remain in a cage. 40 I see a particular deputy governor taking over from a governor. I can't tell the circumstances that led to this, we should pray. 57. There are some super powers we have now that are very strong but will lose the position. Its not as a result of failure but because there's a shift taking place in th realm of the spirit. 60. Ghana will soon experience the same challenge like Nigeria. What is happening in Nigeria will be duplicated in Ghana. The new president will do well but his enemies will be more than his intention. I pray for God's speedy intervention. FRANCE : 61. There will be relative peace from the first quarter of the year but I still see a co-ordinated attack that will still come inside the Nation's capital. I cancel it now! 68. The president should pray over his health. It will be a major challenge througout his regime but God will still keep him. There's is no grace for him to come back after this regime because I see lot of judas and funny people that will advise him to return back. He shouldn't adhere because there is no grace. Have said it before, Zambia president please watch. RUSSIA : 72. The Nation of Russia will have good relationship with USA. Between 2017 - 2018, there will be a relationship Crack between the Russian president and USA president. It will grow sour and become strong. It will become the battle of Ego. It will be like a Lion and Tiger battle.